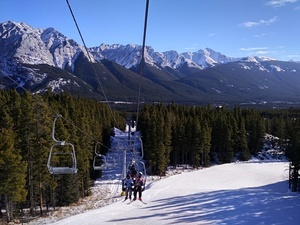 Nakiska was specifically designed to host the alpine events of the 1988 Calgary Winter Olympics. It is located in the heart of the spectacular Kananaskis Valley. 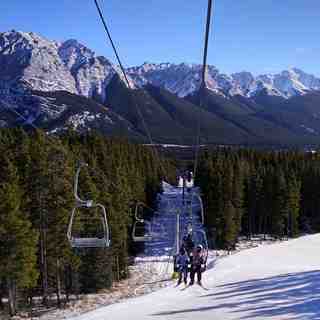 Although designed with ski racing in mind, Nakiska's terrain was carefully planned to meet the needs of family visitors. 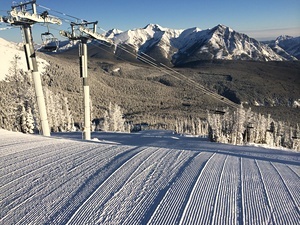 In fact 70% of Nakiska's terrain is rated as intermediate with 16 percent classified as novice and the remaining 14% as expert. Off the slopes, two hotels, located five minutes from the resort, provide more than 420 rooms. Snow conditions pretty bleak but with the cold weather the snow making machines are at full capacity. The main Gold chair is down due to the lift cable being replaced (why wasn't this done in the summer you may ask?) The runs that are open are decent and no rocks. This place doesn't get much natural snowfall. Grass and shrubs still showing right up to the top where there is no snow making. Steepest terrain is closed due to Gold chair being down. We have had a ski pass here for three years only because of the kids being in the racing program. 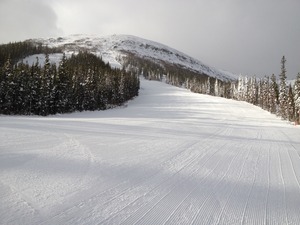 Otherwise, anyone with some skiing ability will want more challenge further west. Very cheap family pass rates can make the lower mountain green/blue terrain packed on weekends but Gold chair is usually quick to load. The glades off Gold chair are fantastic if you have a natural powder dump (pretty rare for this hill).